Work takes me into a wide variety of structures. I've detailed, in this space, some of the historic structures where I find myself. I've documented the intriguing, the goofy and the "huh?". We had to inspect a Sherwin-Williams paint store warehouse several months ago. It serviced not only homeowners, but also contractors. There were the typical paint store accouterments about the front walls; paint chips, computer for matching colors; rollers and brushes; masking tape; all the stuff you'd find in any paint store. We headed to the back, into the warehouse, because the job for which we were doing the inspection was adjacent to the back wall. We walked past cans of neutral base. I expected that. There were several different brands of neutral base. I was a bit surprised because I didn't know Sherwin-Williams owned all these different brands. The store manager said different bases have different sheens and have different tones to their colors. That's why they had a 30 foot wall of paint chips. What's yellow in one brand is more lemon in another. It's about giving the customer options. At the back I saw this. Rows and rows and palettes upon palettes of 10 gallon sized buckets of paint. These are broken down based on a customer's needs. Certain base colors are for certain mixed colors. They had four industrial mixers, giant red machines where they could make one of these Rembrandt Ruby or Calypso or Quest Gray. 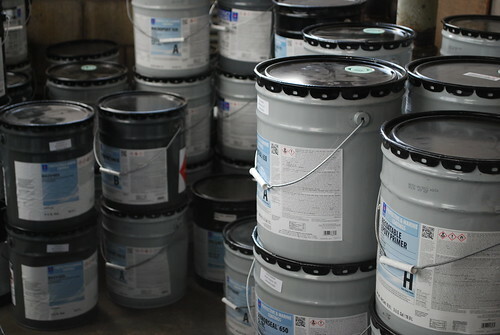 They can make large amounts of one color or several gallons of the same color. They service a number of Sherwin-Williams paint stores so these buckets are broken into gallons of base when a store needs more. Plus, a contractor painting all the hallways in an apartment building, for instance, will want 10 gallons of the same color. He can come here and they'll make it. We've all purchased paint. It comes in a gallon can with a lid whose edge you bend when you have to use the screwdriver to open it because you lost that really neat thing they gave you at the store. It never occurred to me to consider where that gallon comes from. It was fascinating to do my job surrounded by what would become color. Finding this photo reminds me I never did paint the bathroom or the rear entry. I should do that.